Buy, Rent or Skip The Dirt? There are books and then there are BOOKS and then there is The Dirt: Confessions of the World's Most Notorious Rock Band. This is the Granddaddy of all Rock and Roll Biographies. It's the benchmark for which all future Rock Bio's will be judged. Everything that you have heard about The Dirt is all that and more. This was Book #20 that I had checked out from the Library. That's how long I had to wait in line with the waiting list for this one to become available. I've been on a major book reading binge and the first book that I put a hold on was for this one. So, was the wait worth it? Hell **** yeah it was. I really don't know why I never got around to reading this one before. It's been out since 2001. That's 10 **** years. I always had an excuse or I was too busy and kept putting it off for whatever reason. So, I sit here now able to finally cross this off my to-read list. As for The Dirt, it's all here. All the decadence, debauchery, chaos and fights you've heard about over the years are front and center here. When I originally heard about the book being written by Nikki Sixx, Vince Neil, Tommy Lee and Mick Mars I had no idea how it would work. In my mind I originally thought that the 4 of them got together and hashed it out like a regular novel. Not even close. Each member writes their own chapter starting from the beginning and at the end of the chapter it usually ends in a "cliffhanger". Then the next member picks up that thread and takes it from there. Shampoo, lather, rinse, repeat. You get the idea. I'm glad this is how they chose to put the book together because everyone gets their say and we get to hear their point of view. It all works seamlessly, which makes it even harder to put the book down. Even if you already know the stories (which I did), you still can't put it down. I knew this book was good when I caught myself carrying the book from room to room, even if I wasn't in the process of reading. The lions share of the book is handled by Nikki. He is the anchor to which all the others expand on. Nikki's stories I think are the best as he does a great job of painting the picture for the reader. Tommy and Vince follow suit and Mick pops up now and then. Even though Mick has the least amount to say in the book, he really comes off pretty good here. He may be the quietest member of the band, but he has a lot to say when does open up. Some of the things he says will have you agreeing with him and leaving you with a little smirk on your face. Amid all the chaos and insanity of the book, there is a very heartbreaking story when Vince recounts his time regarding his Daughter Skylar and her battle with cancer. If you are not touched by what you are reading, you are dead inside. I've heard the story countless times before. But to actually read Vince's words takes on a whole 'nother level. I definitely recommend this book to everyone. 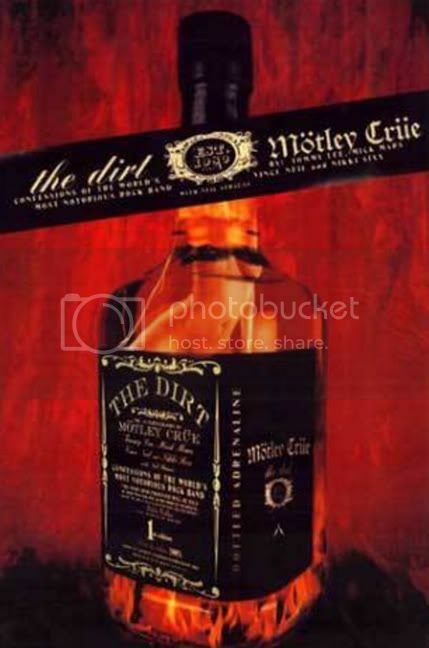 You don't have to be a fan of Motley Crue. Hell, you can hate all the members and you will still come away completely entertained from the first page to the very last page. Of the 20 books I have read so far the past couple of months, I Am Ozzy and The Dirt are the only ones I plan on buying and adding to my personal library collection. On related topic, the proposed film for The Dirt is being held up in limbo as they search for another Director. I really hope to see the book done justice and that it makes it's way to a theater soon. Best. Rock. Bio. Ever. It's....AWESOME!!!!! !